While working with relational data, you would like to show the data in such a way that it should make sense to the user and have good user experience. In this article I will go over how to use the Nested Grid Views with Expand and collapsed functionality to show the data. There are numerous scenarios where we want to show data in Nested Grid Views like Parent & Child. Parent Grid View shows the main information and Child show the relevant information of Parent. Let take an example of showing the Order and Order Details Information. Order Id is the relational Key for Parent and Child. We would like to show the Order and once you click the Order Id you will see the details for that Order. Let's put that together in XML Structure with relationship. I have nested the Order Details data inside the Order data. Let's start joining the pieces to accomplish this. I have shown the final look and feel of our application in Figure 1 and Figure 2. XML has the two pieces of data i.e. Order and OrderDetails which we will be showing in the two Grid Views. So I took a path to create two data models for each object. I have created OrderModel and OrderDetailsModel class to old those values for us. Data models are self-explanatory as they work as Data value objects. Now we have our data store ready and data models ready, let's have the implementation to load the data from XML to values objects as mentioned above. I am using LINQ here to load and query the XML but if you want to use traditional way of getting data from XML feel free to use that. I have two methods as shown above to load and query the data from XML. 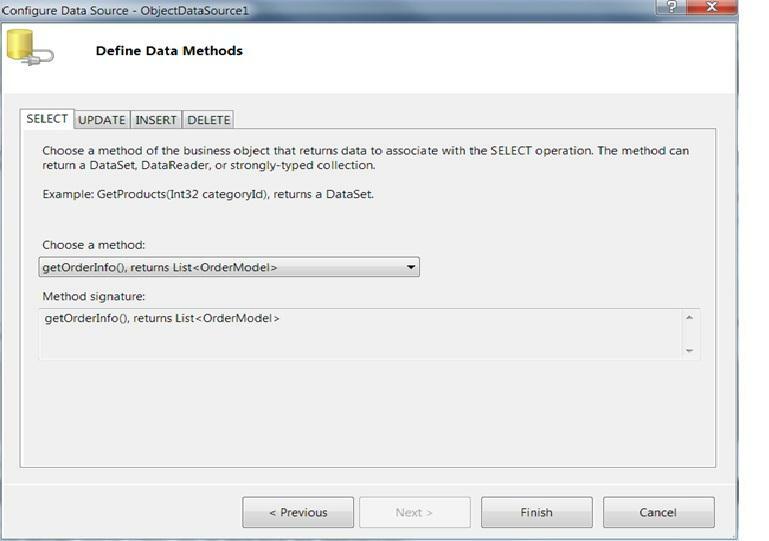 getOrderInfo() is to load the data from XML to OrderModel object for Order which is our parent data as shown in figure 1.
getOrderDetails(string orderId) is to load the data from XML to OrderDetailsModel object for Order details which is our child data as shown in figure 2. Both the methods return the IEnumerable data (List) which we can bind with our grid views. 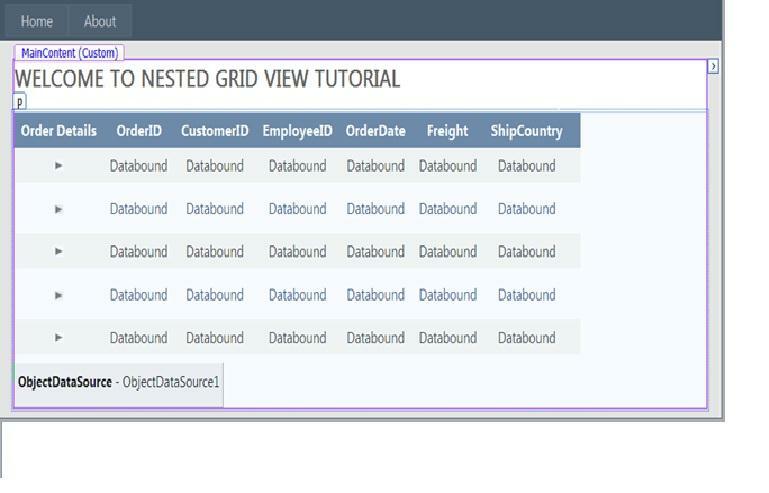 Now we have our objects ready to retrieve the data from XML, let's look into the UI with nested grid view. Before looking into the design and source of our aspx, let's take a look into the ObjectDataSource Data control. I have decided to use the ObjectDataSource as our objects methods are ready and we can go ahead and tie them together instead of binding our gridview by yourself. In figure 3 you will notice the Grid View and ObjectDataSource control. 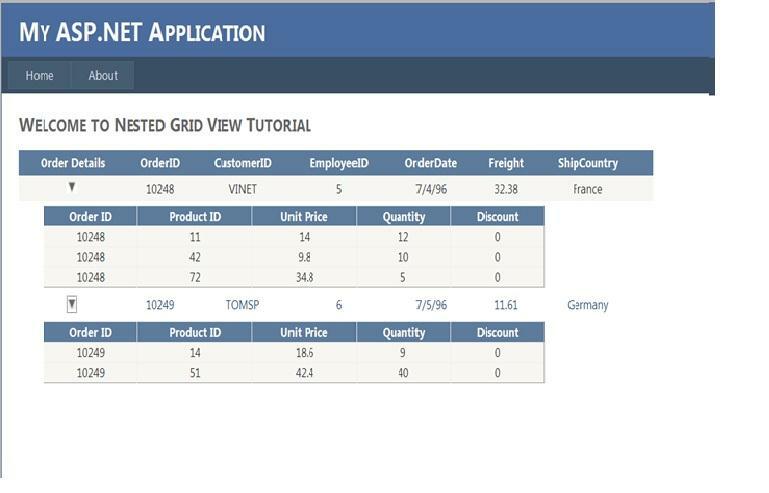 I have bound the Grid View using the ObjectDataSource using the Smart tag of Grid View control. 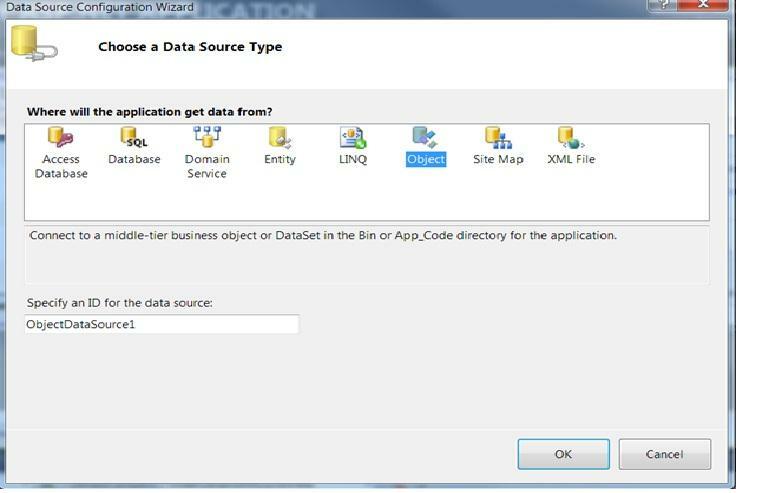 When you choose the new data source from Smart tag it will prompt you to choose the Data source type as show below. 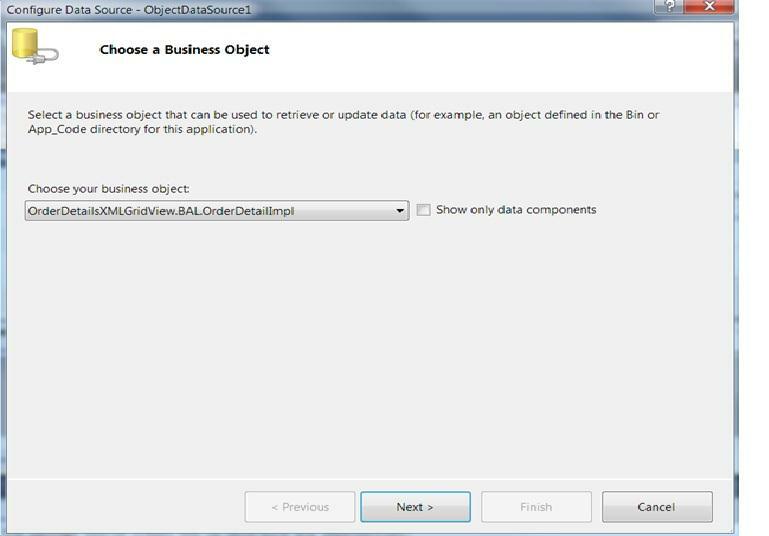 When you choose and configure the ObjectDataSource it will open the Wizard to choose the business object which will return you the data in form on Object value (OrderModel) in our case. It will prompt you to choose the Data Methods type from that object, we have getOrderInfo() methods which is our SELECT data method as show in below figures. Your parent Grid View is bounded with the Data source and it will show the Order Data from the XML. We need to place the second grid view as Itemtemplate of the first gird view. You can do either from design or you can write in the source of aspx page. Let me put Default.aspx source code here and go over piece by piece. <img id="imgdiv<%# Eval("OrderID") %>" alt="Click to show/hide Details" border="0"
<asp:GridView ID="GridView2" runat="server" Width="80%" AutoGenerateColumns="false"
Parent and Child Grid has the relationship key i.e. OrderID. If you look into the source you will see the child grid is wrapped with Div tag which has the Unique Id based on the OrderID Key from the ObjectDataSource. We will be hiding and showing the nested grid data with the help of the Div tag. I am expanding and collapsing the Div using the Java Script. Java script is just using the Div tag style and setting its property to hide or show. We have our layout ready to show the parent and child data with Expanding and Collapsing features. But still the nested grid is not bound with any DataSource then how it will fill up with the child data (Order Details). 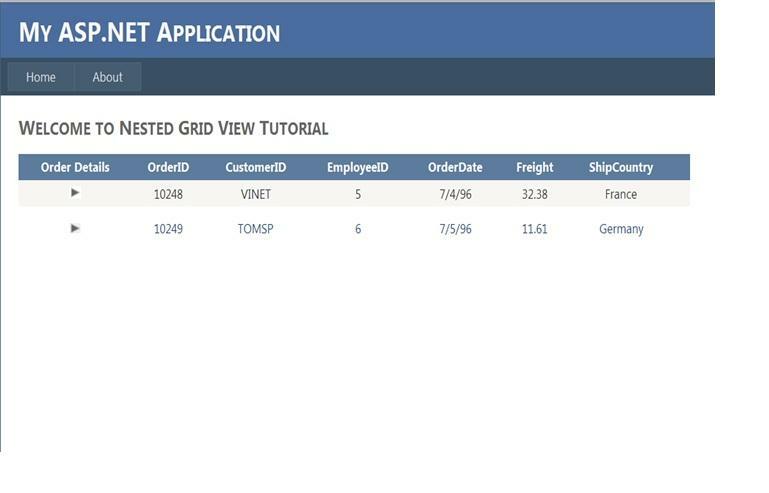 When we click on the GridView it calls the GridView1_RowDataBound event which we will be using to bind the child grid with OrderDetails data. On page load we are loading the XML data into our Models so that ObjectDataSource Datasource will have data to show on the grid. RowDataBound event is called when we click on the first column which is ItemTemplate and it is bound with OrderID column. When the event is called it pass the OrderId value as event argument which we will pass to our second methods as shown above to get the child data from XML i.e. OrderDetails. Thanks for such a wonderful code. Please guide me how can we put a delete function in the same code. I have implemented the delete function also in grid and i think you are looking for the same. You can create one grid column with button or image and need to wire it up with back end code. send me your email id will send you code snippet. I am facing an issue also as I'll get your mail I'll attach the error file also inthat as in reply. Kindly help me. The XML that you are using is different from what I am using please share your email id with me so that I can send you the xml format.